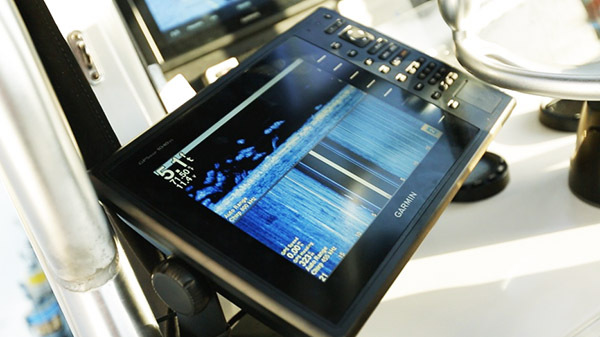 BD’s Michael Torbisco had a chance to test these new Garmin marine electronics with Capt. Rush Maltz of Odyssea Charters out of Key West Florida. Capt. Rush runs his 32-foot Andros for both inshore and offshore sport fishing charters. When asked how this new technology relates to real life fishing stituations, Capt. Rush said, “finding bait and marking fish is crucial to the success of the day. Before, I had to drive directly over the bait to know they if they were there. This meant you could miss the mark by a few feet and be blind to the presence of the bait or fish. Now the swath is incredible. I can mark bait over a hundred feet away on either side of the boat as well as straight down. Troy Simonton of Garmin, brought his expertise of Garmin’s latest advancements in sonar technology along for the ride. Michael had a chance to pick Troy’s brain about the new features they were viewing. Q:What makes the new transducers be able to perform these new capabilities of viewing structure, bait and fish all around the boat? Q:From an engineering standpoint, how valuable is it to spend time prototyping and testing new technology with anglers like Capt. Rush who rely on their electronics daily to help put his clients on fish? A: There’s no substitute for getting out on the water and testing your equipment in the environment it will be used. We did this with the GSD24 and 26 and now the GCV10. You learn so much just from observing and listening to seasoned captains like Capt. 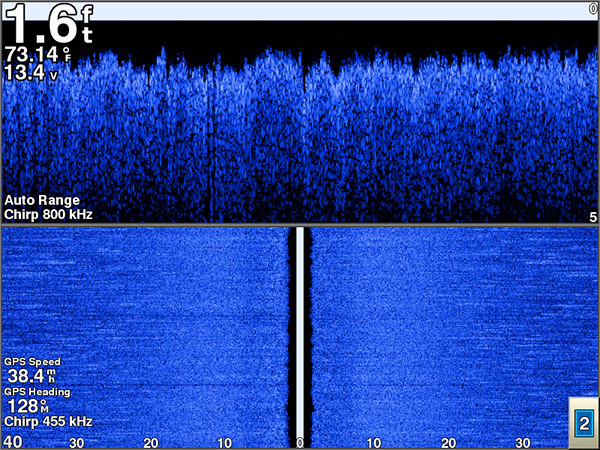 Rush when they use your sounder equipment. What I have really appreciated about Capt. Rush over the years is that he’s a straight shooter. If there’s something he doesn’t like, he doesn’t mince his words. The feedback from our beta testers is relayed to our software team and then into the new software build. Q:Are you pleased with the way the new SideVü performs in the various waters you have tested around the Florida Keys? A: Very much so, we’ve had the typical windy days to deal with and I am pleased with the performance. We found that seas less than 2 feet gave optimal results, but using the GCV10 in 3-4 foot seas remained very usable. 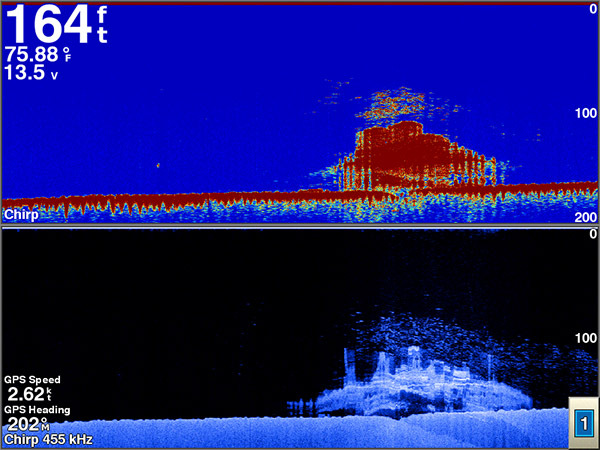 Q:Does depth or speed affect the performance of the sonar? A: As you can see in this screenshot, the picture showing the 1.6′ depth doesn’t look that impressive until you look at the GPS speed and realize we’re tracking the bottom at that speed over a grass flat. You’re seeing the blades of grass in the DownVü shot! 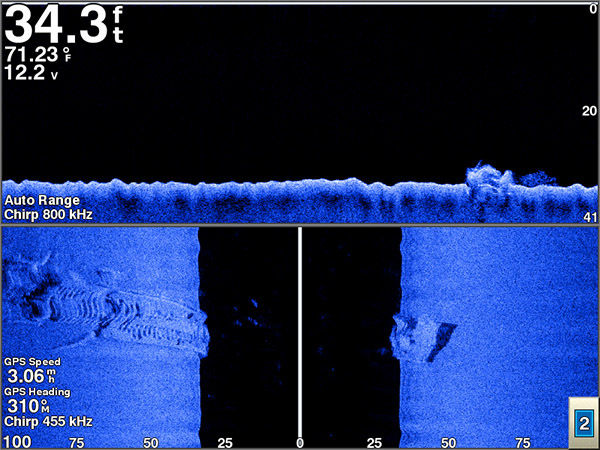 This shot at 58 feet may not be as compelling as a cool box-artwork screen shot, but show that to a fisherman and he’ll notice the large bait ball we imaged at 32.5mph! We spun around on that and sure enough we were on the bait. That’s what it’s all about. Q:Did any particular spots or structures yield results above what you expected and are noteworthy for anglers? A: I really liked the ripples in the sand. I almost feel we could see conch and their trails! The coral reef near the Hillsboro Inlet, the wrecks and associated fish around the Keys and Pompano; everything imaged very well! The range was excellent offshore. CHIRP makes that happen. Q:Is this a technology a boater could gradually step up to by starting with one unit and adding on to it for more features? A: Absolutely! The black-box GCV10 is currently available and networks up with our new lineup including the 7”, 8” and 10” products. This summer the 8000-series will support the GCV10 connected up to a new thru-hull SideVü transducer. Q:Do you have any suggestions on transducer position for best performance? A: Clean water! Just like with any other transducer, you need to make sure there are minimal obstructions ahead of the transducer. Water inlets, hull rivets, other transducers, lower units, you name, if there is something ahead of the transducer it’s gonna affect speed performance. 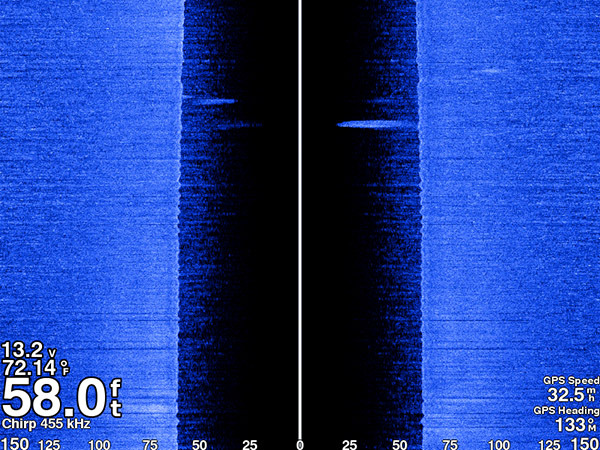 What we’ve noticed though is how well the SideVü transducer tracks the bottom at hi speeds with a clean install. 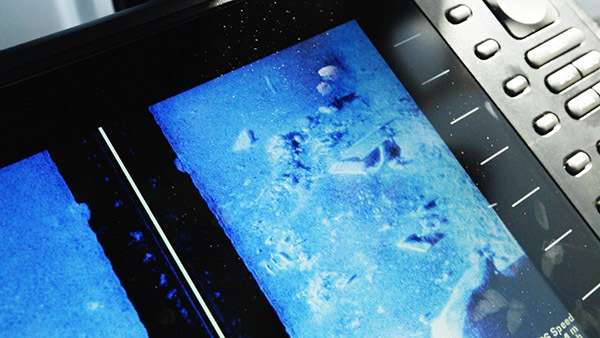 Another important note is that since the SideVü transmits and receives energy out each side and bottom, the lower unit on an outboard can shadow your imaging. 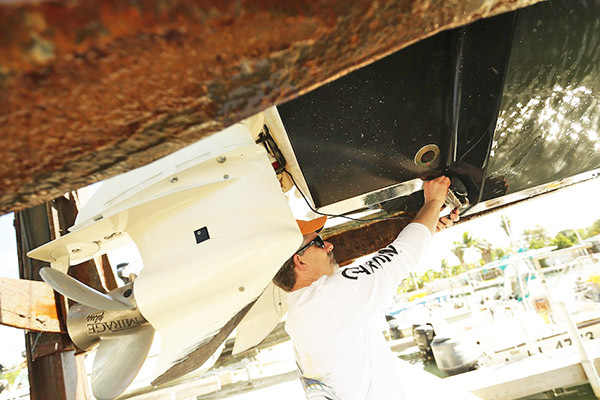 With the thru-hull, the same shadowing can occur if installed on a deep-V hull. 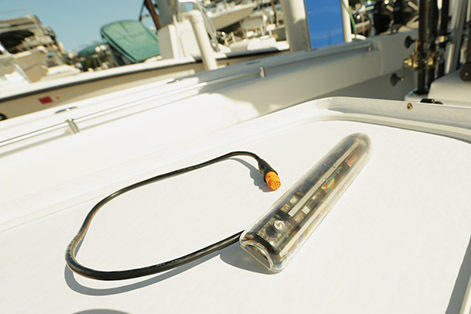 It these cases some boaters will use two transducers, one on each side, along with a y-cable, to get complete coverage. 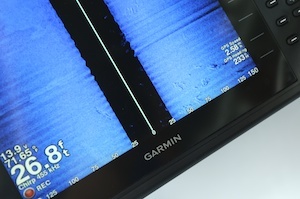 Check out the new user-friendly sonar features from Garmin and see what you’ve been missing.